2.1 Should Bochrim Wear a Tallit? The obligation applies to all Jewish men age 13 and older. A blind man is equally obligated, and should recite a bracha. It would be best for him to first feel and check the validity of his Tzitzit or ask someone else to confirm it for him. Women are exempt, as wearing Tzitzit is a positive time bound mitzvah. A Katan, or minor child who is less than 13 years old, should wear Tzitzit and make a bracha on it, once he reaches the age of chinuch . Should Bochrim Wear a Tallit? The Sephardic custom is to wear a Tallit Gadol from the age of chinuch in mitzvot. Chacham Ovadia adds that this is true even for a boy studying in an Ashkenazi yeshiva. The earliest time to say a bracha on Tzitzit is from the time period that there is enough natural light to be able to distinguish between the white and blue strands within a clump of Tzitzit. This time period is also known as the time when one is able to recognize an acquaintance from a distance of 4 cubits. Both descriptions are equivalent and commonly referred to as Misheyakir. There is a wide range of opinions on precisely what time Misheyakir occurs on a perfect day. In Jerusalem it is considered to be 35 minutes before sunrise, 60 minutes before sunrise, and 66 minutes before sunrise. The various opinions would then have to be extrapolated according to the region of the world and time of year. Thus, according to the commonly accepted opinion that Meshiyakir is between 50 and 60 minutes before sunrise in Jerusalem - In New York, depending on the time of the year, it could be anywhere from 56-73 minutes before sunrise. If one is pressed for an earlier time for work or travel reasons, there are opinions that one may make a bracha on Tzitzit already from dawn. Dawn is 72 equivalent minutes, or 1.2 seasonal hours, before sunrise. However, most modern poskim qualify that one should not rely on these minority opinions unless under “extreme circumstances” and should rather wait at least until the most lenient interpretation of Misheyakir. One may wear Tzitzit before these times, however one should do so without making a bracha. Only when it becomes the time period known as Misheyakir may one make a bracha. If one inadvertently made a bracha before dawn, one should not repeat another bracha when the correct time arrives. However, one should not wear a Tallit Gadol at night, unless one is the shliach tzibur (cantor) for Maariv and is not wearing an appropriate outer garment (for example a jacket). Another exception would be for Sephardim, where it is customary for a chatan (groom) to wear a Tallit Gadol at his wedding ceremony, he may do so even at nighttime. If it is before sunset he should make a bracha and if the ceremony is after sunset then he should wear a Tallit Gadol without making a bracha on it. Although the Shulchan Aruch includes linen as a biblically mandated material, he also cites an opinion that we should not use it. He concludes that although the halacha is not like this opinion, it is preferable to avoid the argument and only use wool. However, if one only has a linen garment for one's Tzitzit, they may be used with a bracha. Leather garments are exempt from the obligation of Tzitzit, even on a rabbinic level. Along the same lines, some poskim equate leather with synthetic materials, such as polyester (usually used for mesh Tzitzit), nylon, and rayon, and maintain that they are also exempt from Tzitzit. Others differentiate between woven synthetic materials, which should be treated like cotton, and non woven synthetic materials, which should be treated like leather. Therefore, it is best not to use synthetic materials for the mitzvah, but if one does one should refrain from making a bracha on it. For a discussion of using Techelet (blue) strings as Tzitzit see the Techelet page. There is also an opinion that there is no size requirement at all. Additionally, there are two different opinions for the conversion of one amah, or 6 Tefachim (fists), to modern measurements: Rav Chaim Na’eh holds it is 48 cm or 18.9 inches make up an amah, while the Chazon Ish holds it is 57.7 cm or 22.7 inches. Additionally, there is a dispute about whether the dimensions include or exclude the center hole within the garment for one’s head and neck. The Mishna Brurah  does not include the neck hole in the measurement, while the Chazon Ish  does. Sephardim: One has fulfilled the mitzvah BUT cannot make a bracha on it when wearing Tzitzit measuring 1.5 amot by 1 amah. It would be preferable if this shiur did not include a neck hole, but if it does and it is difficult to find Tzitzit that size or they are uncomfortable to wear, one may rely on the opinions that say the neck hole is included. In this case, one should make a bracha on a Tallit Gadol and patur (exempt) the Tallit Katan by doing so. In order to make a bracha on a Tallit Katan, it should measure 2 amot (37.8") by 1 amah (18.9"). Tzitzit without techelet is tied in four sections with a double knot before and after each section. Between each section one white string is wound around the others. In the first section it is wound 7 times, the next 8 times, then 11 and 13. Altogether there are 5 double-knots and 39 windings. According to the Rambam, Tzitzit with Techelet is tied with one winding of white and two of techelet for each section and there are 7 sections each with a knot before and afterwards. Altogether there are 8 knots and 21 windings. If one borrows a Tallit directly from its owner in order to fulfill the mitzvah of wearing a Tallit, one may recite the bracha, because we assume that the owner gave it as a present on condition that it is returned. It is however better to avoid this situation. Additionally, if the Tallit is donated to the shul, one may borrow it and make a bracha on it. If one of the 8 strings ripped from the point that the strings hang from the last double knot, the Tzitzit are kosher. 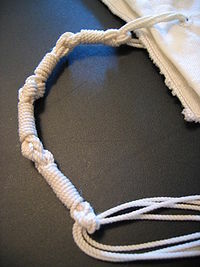 However, if 2 of the 8 strings ripped completely from right beneath the knots, the Tzitzit are kosher only if the two ripped strings come from different sets of 4 strings (one from one side, and the other from the other side), this is assuming that they were tied consistently with the same 4 strings on each side throughout the knotting. (See diagram on right for picture of what is meant by the 2 sets of 4 strings hanging off the Tzitzit knots). If the strings are completely ripped after all of the knots but the strings in the knots section are longer than kdei anivah then in an extenuating circumstance one can use those tzitzit. However, one should not recite a bracha on such tzitzit. The bracha for a Tallit Gadol is "LeHitatef BeTzitzit". If one mistakenly recited al mitzvat tzitzit on tallit gadol he has nevertheless fulfilled his obligation. For a pair of Tzitzit, according to Ashkenazim, the bracha is "Al Mitzvat Tzitzit", while according to Sephardim, if one puts on the Tzitzit regularly the bracha is "Al Mitzvat Tzitzit", but if one wraps one's head with the Tzitzit, one should make "LeHitatef BeTzitzit". The text of the bracha of "LeHitatef BeTzitzit" is: ברוך אתה ה' אלוקינו מלך העולם אשר קדשנו במצותיו וצונו להתעטף בציצת - Baruch Atta Hashem Elokeinu Melech HaOlam Asher Kideshanu BeMitzvotav VeTziyvanu LeHitatef BeTzitzit. The text of the bracha of "Al Mitzvat Tzitzit" is: ברוך אתה ה' אלוקינו מלך העולם אשר קדשנו במצותיו וצונו על מצות ציצת - Baruch Atta Hashem Elokeinu Melech HaOlam Asher Kideshanu BeMitzvotav VeTziyvanu Al Mitzvat Tzitzit. One should recite the bracha just before putting on the Tzitzit. If one did not recite the bracha beforehand, one may recite the bracha the entire time one is wearing the Tzitzit. ↑ Bamidbar 15:38; Devarim 22:12, Rambam Sefer Hamitzvot mitzvat aseh 14. ↑ Rambam Hilchot Tzitzit 3:11; Tur 24:1; Shulchan Aruch 24:1; Rav Ovadya Yosef in Yechave Daat 4:2. See Mordechai (Menchot no. 945) writes that a person should endeavor to obligate oneself in the mitzvah of tzitzit just like Moshe longed to enter Israel in order to fulfill the mitzvot there (see Gemara Sotah 14a). ↑ Rabbi Shimon in Gemara Menachot 43a; Shulchan Aruch 17:2. The Rema (ad loc.) comments even though women are exempt, if they want, they may rely upon the opinion of Tosfot on Kiddushin 31a who would allow a woman to wear and make a bracha on Tzitzit. The Rema continues however, that women still should not do so, since it would appear as arrogant and further that Tzitzit is not a personal obligation anyway. The Mishna Brurah (17:5) elaborates that although women may rely on Tosfot for Lulav and Sukkah, Tzitzit are different since even men are not required from the Torah except if they wear a four cornered garment. Wearing Tzitzit has both a personal as well as an impersonal aspect of obligation to it, which makes the obligation one which allows for leniencies. It is a personal obligation in the sense that only if one wears the garment does one need to attach Tzitzit and not just when one owns a garment. It is not a personal obligation, since it is not required of one to go out and buy a four cornered garment just to perform the mitzvah. Therefore, since men do not really have to wear Tzitzit every day, women certainly should not do so, it appearing arrogant if they do. Lastly, there is a possible concern of violating Beged Ish as Targum Yonatan Ben Uziel raises on Devarim 22:5. The Levush (17:2) and Ben Ish Chai (Lech Lecha 3) use similar logic. ↑ Kaf Hachaim 8:12, Chacham Ovadia Yosef (Yechave Daat 4:2), Chacham Yitzchak Yosef (Yalkut Yosef 17:4). Or Litzion (Chelek 2, 3:7) says that the age is around 5. ↑ Tzitz Eliezer 20:8 notes that the Maharil only meant that before getting married one does not wear a Tallit Gadol, but certainly one should still wear a Tallit Katan (i.e. Tzitzit). ↑ Meaning that there is exactly 12 daylight hours and every seasonal hour consists of 60 minutes. ↑ There are two factors at work here: First, the processes of daybreak and nightfall occur faster at places near the equator than places further away from the equator. Second, the speed of these processes are also affected by the seasons. A common solution would be to use seasonal minutes. In order to calculate a seasonal hour, one would need to add up all the daytime minutes and then divide by 12 to get the number of minutes that are in each seasonal hour. For instance, if there were 11 hours of daylight, each seasonal hour would consist of 55 minutes(11x60:12=55min). To further complicate matters, there are two ways of counting the daytime minutes: The Magen Avraham counts from dawn until nightfall with the emergence of 3 stars, whereas the Gra counts from sunrise to sunset. Another means for calculation, which has only recently been implemented, is to compare the level of brightness by using the relative position of the sun. For instance, it has been determined that 60 minutes before sunrise on a perfect day in Jerusalem the sun is 12.9 degrees below the horizon. Therefore, if one wanted to find the equivalent time anywhere in the world during any season, one would simply need to determine at what time the sun will be 12.9 degrees below the horizon in that locale on that day and that would be the extrapolated Meshiyakir. ↑ MyZmanim.com. These figures are determined using MyZmanim’s earliest published position of 11.5 degrees below the horizon. Unfortunately, MyZmanim.com only offers calculations based upon 10.2 degrees, 11 degrees, and 11.5 degrees but not 12.9 degrees. It is unfortunate because 12.9 degrees correlates to Rav Tukaczinsky’s 60 minutes before sunrise which, although being a very lenient position, is also well collaborated and accepted. ↑ Rav Ovadya Yosef in Halacha Brura 2, 30:1. ↑ Tosfot Gemara Niddah 51b; Rambam Hilchot Tzizit 3:8; Rema 21:3; Mishna Brurah ad loc; Yalkut Yosef Additions 1, 8:5. The exemption at night is based on the pasuk "uritem oto" (Bamidbar 15:39). Rambam Hilchot Tzitzit 3:7 states that this applies to any garment being worn at nighttime. Rosh in Halachot Ketanot hilchot Tzitzit 1 says this refers to any nighttime garment regardless of when it is worn. Ran on Kiddushin 34a "eizo" says that any garment which is either usually worn at night or is currently being worn at night is exempt. ↑ Rav Moshe Feinstein in Igrot Moshe YD 2:137. Though see the Taz 581:2 who seems to disagree because of a concern of putting oneself in a situation of Safek Brachot Lehakel. ↑ Shulchan Aruch 9:1. This is based on the opinion of Rav Nachman in Gemara Menachot 39b. The Rif (Tzitzit 14a) and Rambam Hilchot Tzitzit 3:2, and Sefer Hamitzvot Aseh 14 all rule in accordance with Rav Nachman. ↑ This is based on the opinion of Rava in Gemara Menachot 39b that all materials are able to be used to fulfill one's Torah obligation. Tosfot 39b s.v. VeRav cites the opinion of Rashi and Rabbeinu Tam in favor of Rava. ↑ Mishna Brurah 9:5. In Halichot Shlomo 3:25, Rav Shlomo Zalman Auerbach is cited as saying that one should try to be strict even in the summertime. ↑ Rav Moshe Feinstein in Igrot Moshe 2:1; Similarly, The Vilna Gaon (Maaseh Rav Birchot HaShachar, 17) ,the Chazon Ish (Shoneh Halachot 9:1), and the Steipler Gaon (Orchot Rabbeinu Volume 1 page 18) wore non-wool garments for their Tzitzit. In Teshuvot Vihanhagot 1:18 Rav Moshe Sternbuch cites several reasons that one should be strict and said one cannot learn anything from the rabbis that wore non-wool garments because they had their own reasons. ↑ Pri HaAretz 1; Beit David 8; Shalmei Tzibur 26b; Pri Ha’Adoma 23a; Nachal Eshkol pg. 102:4 ; Ha’Elef Lecha Shelomo 1:4. ↑ Siddur of Rabbi Schneur Zalman, the author of Shulchan Aruch HaRav and The Tanya. Similarly, the Gra, without specific numbers, was very strict in this regard and required the garment extend down to one’s knees. Also, the Chazon Ish 3:31 concludes that it is best to follow this size requirement. Likewise, the Mishna Brurah (8:17, 16:4) suggests this size to avoid difference of opinions. Amongst the disputes on how big the Tallit Katan needs to be in order to have fulfilled one's obligation in Tzitzit, there is a question regarding the neck hole. The Mishna Brurah (8:17 and 16:4) assumes that the neck hole in the middle of the Tallit Katan does not count towards the minimum required measure. On the other hand, the Chazon Ish (O.C. 3:30) argues that as long as the combined width of the shoulders is greater than the width of the neck hole, the hole is counted towards the required measure (Omed Merubah Al HaParutz). He offers two explanations disproving the Mishna Brurah's approach. First, if we take the Mishna Brurah’s understanding to its logical extreme, we cannot count any minute hole (there being many since the garment is woven) making it more difficult to reach the proper size requirements. Additionally, he says if every minute hole does not count, then it should be considered an interruption. Once we consider the holes interruptions, there is no unified area with the proper required measure. The Eshel Avraham (16 s.v. Odot) agrees and infers this from the simple language of the poskim who gave measurement without specifying this distinction. ↑ Yalkut Yosef 16:1, Halacha Brurah 1, 16:1; and See “Tzel Heharim” by R’ Hertzel Hillel Yitzhak, pp. 8-11. ↑ Mishna Brurah 16:1 and 16:4 writes that the cloth that goes over one's shoulders may not be thin strips but rather should be wide enough to be recognizable as clothing. The Eshel Avraham and Kaf HaChaim 16:4 hold that it should be at least 3 Etzba’ot wide. ↑ Beiur Halacha 10: "soder"
↑ Rav Hershel Schachter in a shiur on yutorah.org ("Yevamot 7," min 85) states that he is not strict when it comes to placing Tzitzit on his blanket. See also another shiur by Rav Hershel Schachter on yutorah.org ("Hilchot Tzitzit", min 58-60). The Gemara establishes that the mitzvah of Tzitzit is primarily limited to the daytime. There is a dispute between the Rambam and Rosh whether the Gemara means to restrict the time when the mitzvah applies or to exempt clothing that is usually worn at night. The Tur poses a practical ramification of this dispute. According to the Rosh, who says that clothes which are specified for nighttime use are exempt. Four cornered blankets, since falling under the category of being specified for nighttime use, would therefore not be obligated in having Tzitzit. On the other hand, according to the Rambam who holds that the gemara was restricting the time of the mitzvah, it seems if one were to sleep with a blanket in the morning, the blanket would be obligated in Tzitzit. In fact, the Hagahot Maimoniyot (Tzitzit 3:7) records the Rabbenu Eliyahu MeParis's minhag to put Tzitzit on his blanket. Nonetheless, without explaining, the Bet Yosef 18:2 concludes that widespread minhag was not to put Tzitzit on one's blanket. In defense of the minhag, the Darkei Moshe 18:2 cites the Mordechai who states that one is only obligated in Tzitzit for clothing one wears (Levisha) and not for clothes that simply cover one's body (Haalah). The Magen Avraham 18:8 cites those who disagree with the Mordechai but explains that it would suffice to round one of the corners in order to exempt the blanket from Tzitzit. See Aruch HaShulchan 18:8 who rejects the Magen Avraham's proof by differentiating between on the one hand covering oneself with clothing, and on the other covering oneself with blankets which are only used for covering oneself and never worn regularly. ↑ Shulchan Aruch OC 11:14. Tosfot Menachot 39a s.v. lo writes that we don't have between 7 and 13 sections as does the Rambam because today we don't have techelet. Alternatively, we have between 7 and 13 windings for each section. Mishna Brurah 11:70 explains that the windings add up to 39 which is the gematria of Hashem Eched. Tosfot explains that there are 5 knots between Tzitzit is gematria 600, and together with the 8 strings and 5 knots it represents 613, since Tzitzit is equivalent to all the mitzvot. ↑ Ben Ish Chai Bereishit Halacha 7. ↑ Rambam Hilchot Tzitzit 1:8. Shulchan Aruch 8:9 writes clearly that one must check one's Tzitzit before making the bracha so that one does not make a bracha levatala in case the Tzitzit were ripped. Mishna Brurah 8:21 adds that there is also a need to check the strings close to the Tallit before the knots. Yalkut Yosef (Hilchot Tzitzit pg 80) writes that the minhag is to be lenient as this halacha is only a midat chasidut. One may rely on the fact that the Tzitzit were kosher the last time they were worn, though it is good to check anyway in order not to run the risk of making a bracha levatalla, Yalkut Yosef does not consider it an obligation. ↑ S”A 8:7, Beiur Halacha s.v. Tzarich writes that surely it is preferable to seperate the Tzitziyot before making the bracha because the Gra considers this a certain obligation. However, Mishna Brurah 8:18 writes that if one is late to shul one does not have to seperate the strings. Rosh: If your Tzitzit tore, all of the strings are allowed to have torn a little bit, as long as each of the 4 double strings still has kdei aniva left. Therefore, if 1 string on 1 side completely tears, the Tzitzit would be kosher because the other side of that string is left. Even if 4 strings tear completely on one side, as long as there is kdei aniva left of the 4 strings on the other side, the Tzitzit would still be kosher. In other words, the Tzitzit would only be passul if 1 string on both sides of the four strings tear to a length that is shorter than kdei aniva. If you did not make sure that the 4 double strings’ halves were kept separate, so that we cannot be sure that any 2 strings are not from the same string, then if any 2 strings ripped shorter than kdei aniva it would be considered passul. What if 2 strings rip to less than kdei aniva, but together they combine to the shiur of kdei aniva, and you are not sure if they came from the same large string? Mishna Brurah 3 says that it is a safek whether we can combine 2 strings to be kdei aniva even if we know they are from the same string, so this makes it a sfek sfeka (maybe they are different strings and even if they are the same, maybe they combine), but still the Pri Megadim says one should be strict because one can easily get kosher Tzitzit. However the Artzos HaChaim is lenient. Mishna Brurah thinks that if one of them is long enough to wind around just one string (which is the Eliya Rabba’s opinion of the shiur of kdei aniva, see next section below,) then one can be lenient. The Chazon Ish (OC 3:14) argues with the premise of the Mishna Brurah who holds that it is a safek if different strings can combine to kdei aniva, he holds they definitely cannot be combined to make up kdei aniva. Rabbeinu Tam: Tzitzit comprise 2 techelet strings and 2 lavan strings. In order for Tzitzit to be kosher, either all of the techelet (2/4 complete strings) or all of the lavan (2/4 complete strings) must be complete. Therefore, two full strings must be the complete shiur of 12 gudalin. If all the strings were cut to the length of kdei aniva, the Tzitzit would be passul. If 2 strings tear, even if they were 2 separate strings, it is acceptable because there are another 2 complete strings. But if 3 strings tear (again, even if they are kdei aniva,) the Tzitzit are passul because 3 torn strings means there are not 2/4 complete strings remaining. The Shulchan Aruch 12:1 says the halacha is really like the Rosh, but if possible (meaning if one can easily find other Tzitzit, whilst making sure not to miss praying together with a minyan to get them-Mishna Brurah 13) it is good to be concerned and hold like Rabbeinu Tam. Mishna Brurah 12:11 says obviously it is permitted to say a bracha on Tzitzit, which are only kosher according to the Rosh. The Rama 12:1 says the minhag is like Rabbeinu Tam. The Kitzur Shulchan Aruch (9:13) codifies the opinion of the Rosh. ↑ Rav Mordechai Eliyahu (comments to Kitzur 9:13) writes that kdei anivah is 4 cm. Kitzur Shulchan Aruch 9:13 writes that it is supposed to be 4 agudlin. ↑ Shulchan Aruch 12:3 writes that the opinion of Rashi is that the kdei anivah is measured from the end of the knots and Tosfot and Rosh hold that it is measured from the beginning of the knots. The halacha is that in an extenuating circumstance one can follow Tosfot but the minhag is like Rashi. Yalkut Yosef OC 12:2 agrees. Mishna Brurah 12:13 writes that in an extenuating circumstance it is kosher but one may not recite a bracha upon them. ↑ Mishna Brurah 8:26 was strongly against those who wear their Tzitzit in and says that by doing so you are disgracing mitzvot. He adds that if you received a gift from the king you would surely wear it outside to show it off to others. He also says that tucking them out fulfills the pasuk of "u'ritem oto". This is the psak of Shulchan Aruch Harav 8:18, and the Magen Avraham 8:13 based on the Tosafot Brachot 18a which allows for tucking them in on a dead person because they do no longer have to fulfill "u'ritem oto" if they cannot see. Magen Avraham says this implies that they should normally be out. He says to at least leave them tucked out for the time that it takes to walk four amot. Aruch HaShulchan OC 8:17, 23:2 mentions that in many communities in eastern Europe they would tuck the strings in and he says that this was an incorrect practice. In Nefesh HaRav page 105 Rabbi Herschel Schachter says that some have the minhag to tuck the strings into their pockets or wrap it around the belt and this was the minhag of Rav Chaim Soloveitchik. Tzitz Eliezer 8:3 says that whatever you do is fine. ↑ Halacha Brurah 8:33. Sh"t Rivevot Efraim 4:15 quotes several Achronim however who hold that it may be a disgrace to the Tzitzit to sweat onto them directly, and himself allows being lenient on a hot day. Halichot Shlomo 3:11 says that this would not be a disgrace at all. Sh"t Teshuvot Vehanhagot 1:25 says if you wear them specifically as an undershirt to stop the sweat from wetting your shirt than he is unsure if it would even be obligated in Tzitzit, so one should try to refrain from doing so. ↑ Shulchan Aruch 21:3, Chayei Adam 11:37, Mishna Brurah 21:14, Shulchan Aruch Harav 21:3. ↑ Shulchan Aruch 21:3, Kaf Hachayim 21:13. ↑ Kaf Hachayim 8:12, Yechave Daat 4:36. Halacha Brurah 17:3 says that this age begins once the child can participate in the prayers in the shul. ↑ Keztot Hashulchan 7:7, Eliya Rabba 17:3, Tashbetz Katan 462 based on a Maharil in Hilchot Nisuin. ↑ The Piskei Teshuvot 8:10 writes that the minhag of not wearing a Tallit before marriage spread in Eastern Europe including Lithuania and Poland, however, in Western Europe, specifically Hungry, the minhag was not widely accepted. See Mishna Brurah 17:10 who questions the Maharil simply because he does not understand why someone who is not yet married should not fulfill the mitzvah of Tzitzit. ↑ Kaf Hachayim 8:39. He adds that if one hears kaddish, kedusha, or anything else that one would be required to answer to, one is permitted to do so. ↑ Shulchan Aruch YD 283:4. Rambam Sh"t Pe'er Hador 7 writes that it is a sin to embroder a pasuk on a talit and if one does it should be torn and put in geniza. He gives three reasons: 1) It is forbidden to write a pasuk without writing the whole parsha. 2) Since it is permitted to bring a tallit into a bathroom or use it to cover something dirty you might use this tallit but since it has a pasuk on it it is forbidden. 3) It isn't the minhag. Furthermore, it is an inappropriate use of Ketav Ashurit. ↑ Kaf Hachayim 8:21, although the Minhag Sepharad is not to recite a bracha on the Tallit Katan but rather to exempt it with the bracha on the Tallit Gadol, Ben Ish Chai Bereishit halacha 2. ↑ Sh"t Yabia Omer 8:2, Kaf Hachayim 8:52, 56. ↑ Kitzur Shulchan Aruch of Rav Rephael Baruch Toledano, siman 10, laws of the donning of Tefillin, seif 40. ↑ Shulchan Aruch 8:6 writes that for Tzitzit one can say "LeHitatef BeTzitzit". Rama argues that for Tzitzit one should say "Al Mitzvat Tzitzit". Ben Ish Chai (Beresheet #6) and Kaf HaChaim 8:27 write that if one puts on the Tzitzit regularly the bracha is "Al Mitzvat Tzitzit", but if one wraps one's head with the Tzitzit, one should make "LeHitatef BeTzitzit". This page was last edited on 24 February 2019, at 14:02.